Take an informative, eerie stroll through the streets of this beautiful old railroad town, lined by stunning Victorian homes. 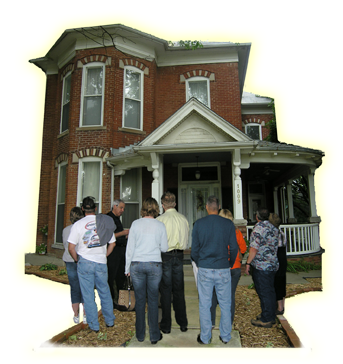 This tour allows participants to have a more in-depth look at the mysteries and the residents, both human and other worldly, of Atchison’s neighborhoods. We will gather at Theatre Atchison before embarking on this unique 90-minute tour. Please check in at Theatre Atchison, 401 Santa Fe, 10 min before your tour. Your name will be on the call list. This tour is a walking tour on uneven surfaces and on slopes. Please wear appropriate footwear. There are no indoor stops along the tour, please dress accordingly. *This event is rain or shine. No refunds or exchanges.